This unit explores the way large and complex pieces of digital information are stored in computers and the associated challenges. Through a mix of online research and interactive widgets, students learn about foundational topics like compression, image representation, and the advantages and disadvantages of different file formats. To conclude the unit, students research the history and characteristics of a real-world file format. How are images and other complex information represented in a computer? How can we reduce the size of digital information and what tradeoffs are involved? Why are there so many different formats for representing the same kind of information? Students are introduced to the standard units for measuring the sizes of digital files: bytes, kilobytes, megabytes, gigabytes, etc. and research the sizes of files they make use of every day. 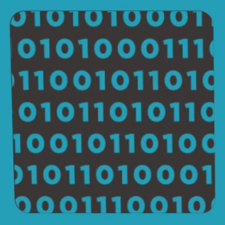 Students explore methods for encoding digital images in binary which requires representing metadata such as width and height as well as pixel data. 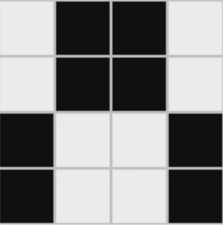 Students use the the Pixelation widget to encode simple B&W raster images. Students learn about the RGB color encoding scheme and use an updated version of the pixelation widget to encode color images. Hexadecimal notation is useful for representing larger groupings of binary digits. 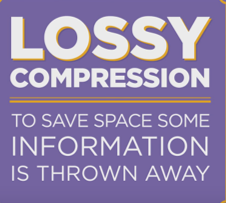 Students learn the difference between lossy and lossless compression. They then research three different real-world file formats for images and sound and compare them using the concepts and vocabulary they’ve learned through the unit. In this lesson students will conduct a small amount of research to explore a file format either currently in use or from history. Students will conduct research in order to complete a "one-pager" that summarizes their findings. They will also design a computational artifact (video, audio, graphic, etc.) that succinctly summarizes the advantages of their format over other similar ones. Increasing Focus on Research: Unit 2 includes an increasing focus on research skills students will use throughout the rest of the course and eventually on the Explore PT. Researching computing topics is a challenging skill which students will need to develop separately from the other skills and content knowledge. Lesson 5 and the Rapid Research activity in Lesson 6 in particular explicitly review these research skills as students apply the knowledge they’ve developed elsewhere in the unit to research the differences between familiar file formats. A Familiar Pedagogy: Many of the lessons in this unit will feel similar to Unit 1 Chapter 1. Students will explore real world concepts and problems in data representation through collaborative problem solving activities. This process is aided through the introduction of two new widgets, the Text Compression Widget in Lesson 2 and the Pixelation Widget in Lessons 3 and 4. As with the Internet Simulator, students can’t “break” these tools and so are encouraged to freely explore them with minimal content frontloading to discover the concepts they highlight. In keeping with the “ABC CBV” approach, technical vocabulary is only introduced only once these exploratory activities ensure all students have developed a shared understanding of the concepts.